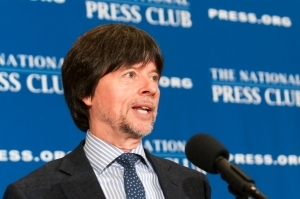 Ken Burns speaks at a Club Luncheon. "The Roosevelts" is a seven-part look at Theodore, Franklin and Eleanor Roosevelt that is running on PBS stations through Sept. 20. An honorary Press Club member, Burns received his new membership card along with the traditional mug at the end of the luncheon from Club President Myron Belkind. All three Roosevelts dealt with the press, Burns said. Eleanor held twice-weekly press conferences with only women reporters. Franklin, who had been an editor of the Harvard Crimson and considered himself a newspaper man, held 998 press conferences while president from 1933 to 1945. Burns said he wasn't sure that either Theodore or Franklin “could have gotten out of Iowa” in today’s media climate, he said, referring to the first-in-the-nation caucuses in presidential elections. The media would have been distracted by Franklin’s struggles with polio, he said, as well as Theodore's temper that could have resulted in "10 Howard Dean moments a day.” Former Vermont Gov. Howard Dean sought the Democratic nomination president in 2004 and had a meltdown after losing in Iowa.